25-year old Harold Boettcher, then working as a mechanic in the town of Solomon, wanted to move his family somewhere with more opportunities. At the urging of local newspaper owner C.W. Hamilton, Harold decided to check out the City of Beloit. Since it was in season, he filled his car with cantaloupe and traveled to Beloit, selling the cantaloupe to finance the trip. Liking what he saw, Harold returned to Solomon, packed up his family and all their belongings and moved to Beloit. Harold purchased a small shop and on November 1, 1937 opened Beloit Battery and Electric, a repair shop focusing on the repair and maintenance of electrical equipment for local farmers. With his knack for fixing just about anything, Harold quickly became a valued asset to the community. In fact, when he received his draft notice during World War II, the local farmers banded together and successfully petitioned the Draft Board to keep Harold in Beloit because they relied on him to keep their equipment, and therefore their livelihood, running strong. Shortly after the end of World War II, The Rural Electric Administration (REA) came to Beloit with the intent of outfitting local farms with electricity. Sensing a great opportunity for both his business and the City of Beloit, Harold worked tirelessly to assist the REA with this mission and his efforts were instrumental to its success. Building on the foundations of his success assisting the REA, Boettcher gradually began to expand his business into other areas, these new ventures further bolstered by his budding reputation in the community. Harold's son, Jerry, graduated from Kansas State University in 1963 with a B.S. in Nuclear Engineering and the Massachusetts Institute of Technology in 1966 with an M.S. in Industrial Management, and worked in finance until joining the family business in 1979. During his tenure with Boettcher Supply, the company faced new challenges as the traditional supplier market began to change. By the early 90's, the traditional supplier market began to disappear as local hardware store owners, plumbers, farmers and electricians - Boettcher's historical client base - began to retire or were run out of business by larger corporations. Rather than lament this shift, Boettcher Supply reinvented itself to compensate for the decline of their traditional markets, expanding into telecommunications systems. Today, they specialize in providing telephone systems for hospitals, cities, county-level organizations, schools and large institutions of all kind in addition to their traditional offerings. Boettcher Supply prospers today because the Beloit community afforded a hard working young stranger an opportunity. The small business began by Harold Boettcher in 1937 still thrives (going on 80 years) because it is committed to its community, its employees and the belief that any situation is an opportunity if you allow it. The Boettcher name has become synonymous with quality and the company continues to focus on the future, always looking to expand into new avenues to better serve their valued customers. 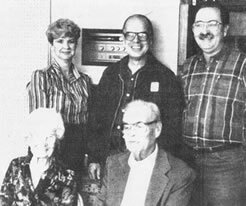 At the 50th anniversary celebration of the founding of Boettcher businesses in November of 1987, Zelma and Harold Boettcher (front) are pictured with long-time employees, Deanna Meier, son Jerry Boettcher, and Larry Golladay. Meier and Golladay had worked for Boettcher Supply since 1959. Jerry Boettcher 60th anniversary photo.